SUMMARY: Mizuno's Generation model of youth baseball bats has always been its' most popular line similar to how the Mako line is Easton’s best and well-known model. The 2018 Mizuno Generation USA youth bat continues a proud Mizuno tradition of aluminum youth baseball bats. They have provided quality swings to youth hitters for years. The new Mizuno Generation USA bat features the company’s exclusive lightweight HotMetal alloy single piece construction. When combined with Mizuno’s CorTech technology, youth hitters receive a massive sweet spot region, increased efficiency, and maximum performance. The 2018 Generation also encompasses an optimized end cap at the tip of the 2 5/8 big barrel adding pop potential, stronger durability, and a loud sound when connecting with baseballs through the strike zone. Like all 2018 Mizuno models, the Generation’s handle will come prewrapped in Mizuno’s Speed-Helix Grip which assists in decreasing vibration control and adding higher levels of comfort through its ultra-stiff feel. 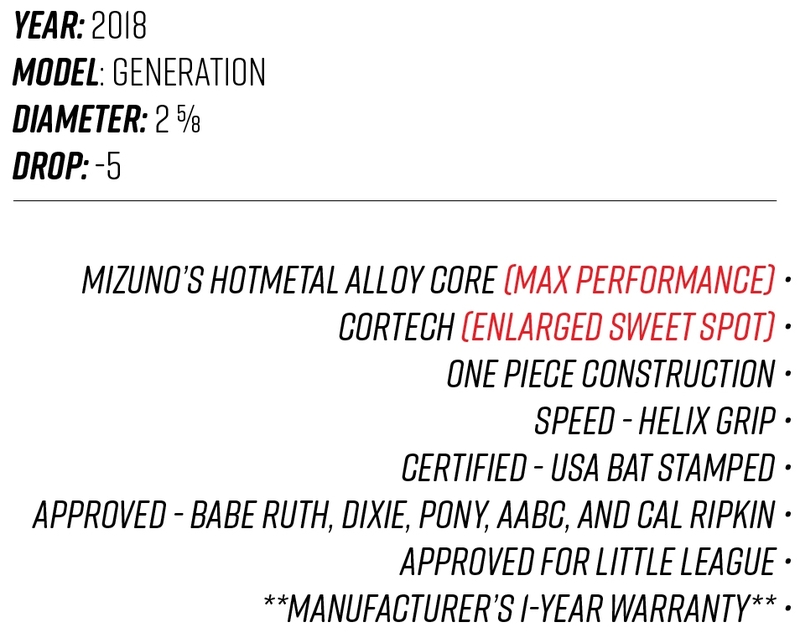 The 2018 Mizuno Generation USA youth baseball bat doesn’t pack the punch of the Mizuno MaxCor, however it’s one of the best valued up for purchase this year. OUR REVIEW: The Mizuno Generation is one of two -5 drop youth bats Mizuno has developed for the new USA Bat standard that takes effect on January 1st, 2018. While evaluating the performance of this youth baseball bat, we had to take into account a few specific parameters. First, in being a drop -5, this bat houses much more mass than the majority of the other 2018 youth bats available for purchase. We reserved the testing of this one for our volunteer youth hitters who possessed the strength to produce a level swing with a heavy swing weight. Second, each volunteer hitter we utilized for evaluating Mizuno's MaxCor were also used for the Mizuno Generation. Both Mizuno youth bats come as a drop -5 and both encompass an aluminum barrel (comprised of different types of alloy). The MaxCor features more technological advancements and comes with a heftier price tag. When evaluating the Generation, we aimed to see if it performed similar to its Mizuno counterpart. After over 300 swings involving solid contact on the baseball, below is our official review of the 2018 Mizuno Generation USA youth bat -5 drop. POP: Although the Generation displayed consistently hard shots when our hitters made solid contact, other youth USA bats with a drop of -5 (Easton Ghost X, Beast X, Axe Elite, Mizuno MaxCor) performed better. The Generation youth bat provides a lighter swing weight and might be more suited for young ball players who are beginning the transition into smaller height/weight ratios. When specifically comparing the potential of pop from the Mizuno MaxCor and the Mizuno Generation, the MaxCor outperformed the Generation by about an average of 15-25 feet of net distance per solid connection on the baseball. VIBRATION CONTROL: Upon analyzing our volunteer Generation scorecards, about 30% of them reported feeling a consistent stinging upon the hands. This average is much higher than many of the USA bats we have evaluated including the Mizuno MaxCor. When comparing all the special technological features of the MaxCor compared to the Mizuno Generation, the MaxCor offers a few extra innovations that specifically target limiting these shock vibrations. DURABILITY: In measuring the durability of the Generation, we thoroughly examined all aspects of the barrel and handle looking for any significant damages that could come in the form of cracks, dents, or dings. Each of the 2018 Mizuno Generation youth bats we tested definitely endured a multitude of typical handling marks and scratches however they withstood enough damage to warrant a very positive score. OVERALL EXPERIENCE: Despite the 2018 Mizuno Generation USA bat not receiving quite the scores as its counterpart the Mizuno MaxCor, this doesn’t mean that the Generation isn't of value. In our opinion, does the MaxCor deliver more performance for hitters who can manage a quick level swing with a drop 5? Yes. Do we believe the 2018 Mizuno MaxCor offers hitters a plethora of extra technological innovations more than the Mizuno Generation? Yes. Do we believe that the Generation is a waste of money? Absolutely not. The Generation is a perfect youth baseball bat for those baseball players who are beginning the transition of swinging heavier USA bats. The Mizuno Generation offers a lighter swing weight than the MaxCor and will help develop a level swing much better as well.